Become the young woman you were made to be while you wait for God's best. You are beautiful, valuable, and completely unique from anyone else who has ever lived in history! If this is really true, why would we want to act like everyone else-especially the world? 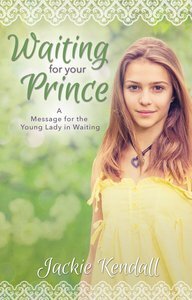 In Waiting for Your Prince, Jackie Kendall encourages you to live like the priceless treasure God created you to be. Wait for God's best and show the world that you have something that so many desperately want: You are secure in the young woman God made you to be! About "Waiting For Your Prince"